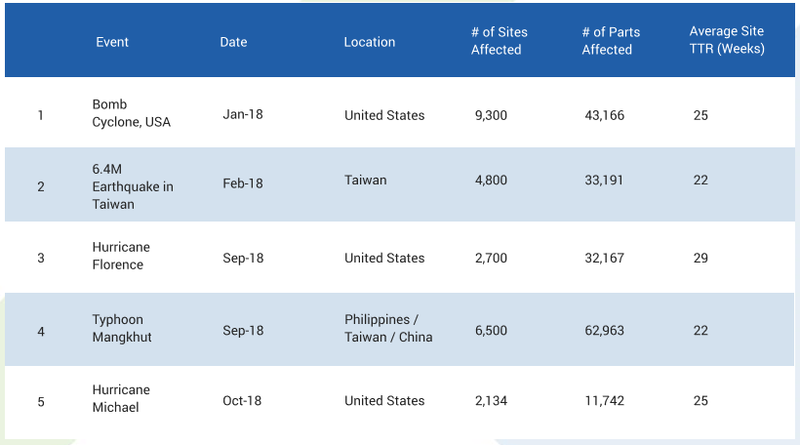 The table above provides the top 5 most significant events in 2018 in order of when they occurred and provides impact data including the number of supplier sites impacted, the number of parts impacted and average site time to recovery (TTR). Three of the top 5 most significant supply chain events took place in North America and two in Asia Pacific in 2018. For the top 5 events, 54 suppliers confirmed that their sites were affected and provided time to recovery (TTR) to their customers through Resilinc’s supplier impact confirmation system. The chart above provides the top 5 supply chain event types, comparing 2018 to 2017. Merger & Acquisition saw an increase in event alerts from 2017 while holding to 17% of the total alerts issued. Factory Fire/Explosion also saw an increase from 2017, though its percentage of the total actually decreased from the year prior. Reorganization/Management Change saw a dramatic increase in alerts issued in 2018 increasing from 5% to 7% to take the third position. Business Sale or Spin-off observed a slight increase in the number of alerts issued for the year, though its percentage of the total decreased to 6% from 7% in 2017. Factory Shutdown/Disruption held at 6% 6% for 2018, securing the fifth position. Combined, the top 5 supply chain event types represent 51% of all alerts published by EventWatch in 2018.